After Rumi the Muslim as America's best selling poet and Om Kalthoum the Muslim as the world's best-selling female musician, comes Omar Souleyman the Muslim as the word's most prolific recording artist. Like Rumi and Om Kalthoum, Omar Souleyman's claim to fame should be prefaced by 'arguably'. Born in the northeastern region of Syria but now exiled, he started his career as a part-time wedding singer. It is estimated that Omar Souleyman has recorded around five hundred studio and live albums, the majority of which were made at weddings for guests and subsequently copied and sold locally. There are no definitive figures on the most prolific musician. But claimants to the title include Indian singer Asha Bhosle, who, according to the Guinness Book of Records has recorded around 11,000 songs, Nana Maskouri with 450 albums, and the Japanese ‘noise’ artist Merzbow with 418 albums. Omar Souleyman, who is a Sunni Muslim but practises religious tolerance, now has a large international following and appeared at the Glastonbury Festival in 2011. If Westerners are familiar with Syrian music at all it is the traditional forms. 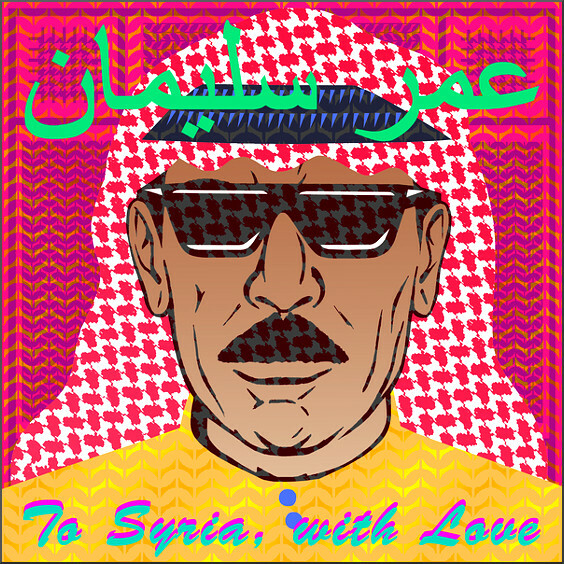 In stark contrast, Omar Souleyman's development of the traditional dabke danced to at rural weddings mixes keyboards, electronic beats and vocals - sample his latest album From Syria with Love via this link. Changing the direction of this path, it is now time for me to finally accept two self-evident truths. The first is that our so-called social media is both toxic and sterile; the second is that any empathy I had for it is now exhausted. Additionally I have seen too many of my peers succumb to the virus of social media addiction. So it is time to distance myself from that delusional world. This means I will no longer add links on social media to my posts. Instead email notifications of future Overgrown Path articles can be received by registering on the side-bar. I will doubtless lose some if not most readers as a result. But so be it - please remember both Benjamin Britten's teaching that "music demands ... some preparation, some effort" and also that there is no such thing as a free Facebook account. What is far more important than the continuing farce of Facebook - a social media platform described so pithily by Rolling Stone as "a tossed-off hookup site turned international cat-video vault turned Orwellian surveillance megavillain" - is the continuing tragedy of Syria, which Omar Souleyman references in his new album. No review samples used in this post. Any copyrighted material is included as "fair use" for critical analysis only, and will be removed at the request of copyright owner(s). It is worth noting that a significant number of readers have registered to receive future Overgrown Path posts by email. So it seems there is life after Facebook for those prepared to make a little effort.